I probably don’t need to tell you that Ms. Riley is not a Mormon. I have no idea where she got this mistaken notion about Mormons being non-proselytizing unless they are serving formal missions. She read the Ostlings’ Mormon America, but she wouldn’t have learned it from that book. She spent some time on the BYU campus in Provo, UT, but surely she didn’t learn it there. At least since 1959, when LDS President David O. McKay said in General Conference, “every member a missionary,” lay-member missionary work has been a high priority for Mormons all over the world. Just last General Conference (October 2007) this was emphasized in a talk by Seventy Erich W. Kopischke where members were called on to use the missionary training manual Preach My Gospel in order to become better at finding people who will agree to meet with LDS missionaries. Members are encouraged to become better at “working hand in hand with missionaries,” becoming one with them in their “efforts to proclaim the [restored] gospel” (“Preach My Gospel—the Unifying Tool between Members and Missionaries,” Ensign, Nov 2007, 33–35). Indeed, how many non-Mormons reading Mormon Coffee who have come into contact with Latter-day Saint neighbors or co-workers have not been given at least one “pass-along card”? “‘Wherefore, now let every man learn his duty, and to act in the office in which he is appointed, in all diligence. Pretty strong words. Compelling. Which is another way of saying Mormons are “obliged to proselytize.” Whether they do so by employing “a constant bombardment with invitations to join up” would really need to be determined on a case-by-case basis. This entry was posted in Misconceptions, Mormon Missionaries. Bookmark the permalink. 10 Responses to Proselytizing: No Obligation? I don’t live in Utah (I live in an area of Texas that has a surprisingly large number of LDS members), but it is definitely true, from my experience, that LDS members proselytize extensively, whether they’re missionaries or not. This is true of their youth as well (I go to high school with my Mormon friends). My LDS friends are always inviting me to Ward dances and youth events at their ward and such. I’m not the only one they invite, either. However, the Mormons I know don’t do a “constant bombardment”. 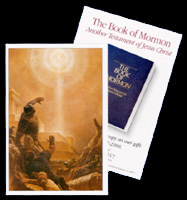 I’ve received a Book of Mormon and a few pages printed off of Mormon.org, but my LDS friends know now that I’m not interested in joining, so while they invite me to events, they don’t seek me in doctrinal conversation, and they don’t see the vast difference between Christianity and the Mormon church anyway, so they see no cause to be particularly concerned about me, for the most part. Sharon – my experience has been that the culture backs up the “off the mission – not a missionary” attitude and behavior — irrespective of the LDS leaders admonitions to the contrary. Likewise, my experience has been that if you ask or show interest to a general LDS member, they will effectively avoid questions and say “Let me have the missionaries meet with you” — and the member may “sponsor” the meeting by having it in their house, but the practical role of the missionary, in practice seems to fall squarely on the missionary elders. Romney has modeled this culturally as well, as he routinely falls back to the “If you have questions about what my Church teaches, ask them, that’s not my Job.” side-step. I haven’t seen this at all. I do have 2 LDS friends who I have gotten into extensive theological discussions with. But I wouldn’t categorize it as proselytizing. My husband and I know several LDS members through his work, but at first we were surprised and kind of disappointed that no proselytizing took place. He even commuted in with a Mormon guy a few days a week, and they never got into anything. We thought it strange. I have to hand it to Mormons…they do a much better job at proselytizing than we Christians do…they put us to shame. Remember that mormon proselytizing is often more subtle than knocking on doors and handing out the book of mormon. Knocking on doors is a pretty poor method, very inefficient. Most of the converts that we knew as mormons were brought in by casual relationships that turned ever so subtly into proselytizing. When the frontal assualt fails, the backdoor approach often works. I’m a non-Mormon living in a Mormon neighborhood. I have gone to the Mormon Church for parties, and on Mondays to my neighbors to attend their family time – to many friends houses. I was not aware about their family time at that time. Their primary aim is to discuss the prophet and Book Of Mormon. One neighbor gave a Christmas gift on a Christmas day after inviting us to their home. The gift was a Book Of Mormon, and a 3 page letter in it. We gave back the BOM because we felt the letter in it was very offensive. We did not respond to this neighbor in any mad manner after that. Unfortunately this neighbor never look at us after that incident. She excluded us from any neighborhood activities after that. It is true that every member of the Mormon Church is in active conversion. This happens at work too. The principal of a School in provo gave my wife a Book Of Mormon on her first day to work. My experience has always been to be a “Member Missionary” all the time. I certainly can stand up and be counted as one of the most enthusiastic about being a member missionary. I was a “Stake Missionary” for two years in Michigan. My parents are trying to get me back into Mormonism by means of my husband. His mother just passed away and my dad itched to talk with him about eternity. Fortunately, my husband is well grounded in his Christian faith and already knows about eternity! Well, guys, this thread’s sounding kinda FLAT so let me see if I can breath a little LIFE into it for ya. You see, the “Church of Jesus Christ of Latterday Saints” (some of you prefer ‘mormons’ – makes the ruse about us not being Christians SLIGHTLY less obvious) believes in a LIVING Christ. No crosses on the churches, speaks to us today (through LIVING Prophets) just like He always did in the Bible – and we actually believe that DOING something about what He said bears some significance – like when He said ‘go out into the world and teach all nations’ (hence member missionary work). 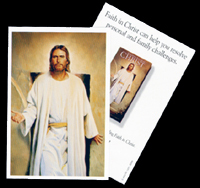 See – a LIVING Christ. Now, you EVs, you have crosses on you churches, you don’t let Him speak anymore – just close the Good Book and that little inconvenience is taken care of – and then you leave the work of salvation all up to Him! No, no, no – we don’t want to hear from You any more – you just sit there on the self and behave yourself. And then when the time comes – well, you save us, right? That’s YOUR job. Okay, now I’ll just wait. This should be fun! From your Living Christ Christian (e.g. “mormon”) blog buddy.